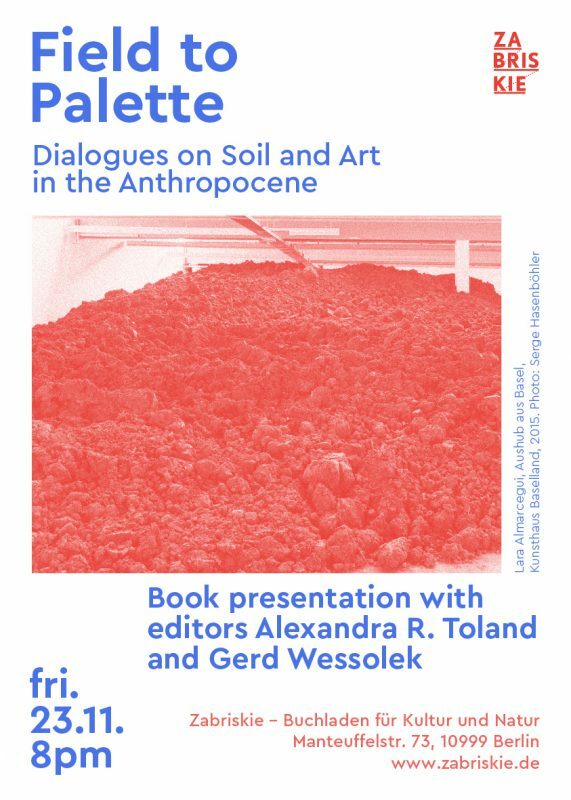 Field to Palette: Dialogues on Soil and Art in the Anthropocene is an investigation of the cultural meanings, representations, and values of soil in a time of planetary change. The book offers critical reflections on some of the most challenging environmental problems of our time, including land take, groundwater pollution, desertification, and biodiversity loss. At the same time, the book celebrates diverse forms of resilience in the face of such challenges, beginning with its title as a way of honoring locally controlled food production methods championed by „field to plate“ movements worldwide. By focusing on concepts of soil functionality, the book weaves together different disciplinary perspectives in a collection of dialogue texts between artists and scientists, interviews by the editors and invited curators, essays and poems by earth scientists and humanities scholars, soil recipes, maps, and DIY experiments. With contributions from over 100 internationally renowned researchers and practitioners, Field to Palette presents a set of visual methodologies and worldviews that expand our understanding of soil and encourage readers to develop their own interpretations of the ground beneath our feet. In an age of accelerated global soil degradation, creative approaches to protecting soil are warranted. Fied to Palette, edited by Dr. Alexandra R. Toland, Dr. Jay Stratton Noller and Dr. Gerd Wessolek and published by CRC Press is a transdisciplinary, multimedia reflection on the representation and meaning of soil resources in an age of crisis. It covers critical positions on land use, biodiversity, and many other facets of cultural dependence on the soil. The launch will be moderated by editor Alexandra R. Toland. Dr. Alexandra R. Toland is a visual artist and environmental planner with research interests in ecosystem services, urban ecology, soil and culture, and the Anthropocene. She is junior professor for arts and research at the Bauhaus University of Weimar and has previously lectured at the Technische Universität Berlin, University of Arts Berlin (UDK), Humboldt Universität zu Berlin, and Leuphana University. She co-chaired the German Soil Science Society’s Commission on Soils in Education and Society from 2011 to 2015 with Gerd Wessolek and continues to write and make artwork about soil. Dr. Gerd Wessolek is a soil physicist and painter who has pioneered efforts at giving soils and soil science a broader exposure to wider audiences through presentations, exhibitions, and soil art projects. Information on his research on urban soils in the vadose zone and an online gallery can be found at www.boden.tu-berlin.de Since 1999 he has been chair of the Soil Protection Department at the Technische Universität Berlin.